Party supporters buoyed by success in the recent panchayat polls; Trinamool banks on the charisma of Mamata Banerjee. Prior to September 2017, flags of the Gorkha Janmukti Morcha (GJM), the dominant political force in the Darjeeling Hills, fluttered on almost every household in the region. Not any more. Much has changed since the violent agitation and the 104-day strike in the hills between July and September that year. As the constituency goes to the polls on April 18, not only have the GJM flags disappeared but large posters of Chief Minister Mamata Banerjee have emerged on the highway leading to the hills. 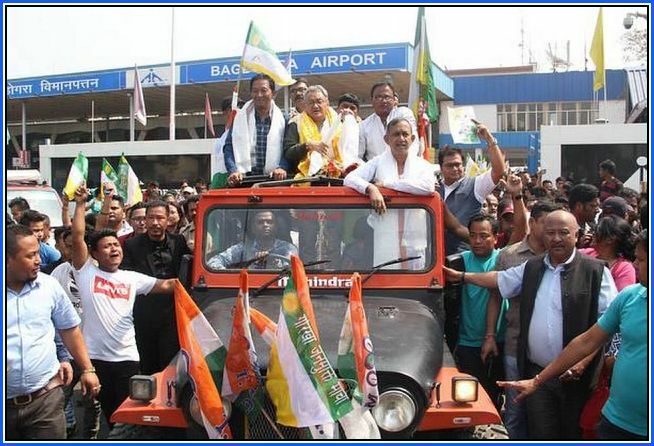 GJM founder Bimal Gurung, facing several police cases, is away from the hills. The ruling Trinamool Congress has made attempts to replace him with Benoy Tamang, appointing him head of the Gorkhaland Territorial Administration, a regional autonomous body of the hills. However, the Trinamool has nominated Amar Singh Rai, the GJM MLA from Darjeeling, as its candidate, acknowledging his Bhumiputra status. In the other northern district of Alipurduar, where the BJP’s chances appears to be the strongest, party supporters are buoyed by their success in the panchayat polls last year. “Despite huge threats and intimidation during the rural polls, we won 308 panchayat, 55 panchayat samiti and one zilla parishad seat,” said Manoj Tigga, BJP MLA from Madarihat in Alipurduar. The BJP’s support base has gradually grown in the district, Mr. Tigga said. “In the 2014 Lok Sabha polls, our candidate got 27% of the votes and in 2016, I won Madarihat with 44% votes,” he said. And the BJP’s challenge to the Trinamool extends from Darjeeling and Alipurduar, through the six seats of north Bengal in the Terai and Doars region to further south in the Dinajpur South and Dinajpur North seats. The Trinamool is, however, relying on the charisma of Chief Minister Mamata Banerjee, the development work done by the government in north Bengal and its considerable organisational support. Reflecting the changing political fortunes in the State, Mr. Ghosh tried to press the point that the Trinamool chairperson is the face on all seats and candidates nominated by the party are no big deal. The Trinamool candidate from Cooch Behar, Paresh Chandra Adhikari, was a veteran All Indian Forward Bloc leader and Food Minister in the Left Front government. In fact, in three of the six seats in north Bengal, the Trinamool has fielded persons who have either recently joined the party or switched from other political parties. As in Cooch Behar and Darjeeling, the Trinamool candidate from Raiganj, Kanhailal Agarwal, walked over from the Congress as recently as March 14. Biswanath Chakraborty, psephologist and Professor of political science at Rabindra Bharati University, said that unlike south Bengal, each of the eight seats in north Bengal had a different poll dynamic. Experts point out that from Darjeeling to Malda, there is an eclectic mix of different communities — Gurkhas, Rajbanshis and minorities and Bengalis. From the hills to the tea gardens in Terai and Dooars and in densely populated areas of Uttar and Dakshin Dinajpur and Malda, there are several factors and issues which can tilt the balance. “Even at the height of the Left Front rule, the Congress, which was the main Opposition party, had a considerable number of MLAs from north Bengal. People of north Bengal have always preferred a national party,” said Abhijit Roychowdhury, BJP president of Siliguri. Mr. Roychowdhury says there is “mistrust of the Trinamool which comes with the BJP’s rise”. The Trinamool, however, is leaving no stone unturned. Prominent party leader and State Tourism Minister Gautam Deb said it was going to be a “do or die elections” for the Bengal’s ruling party. Mr. Deb said that the party, which has nominated a Gurkha candidate in Darjeeling, will actively involve Gurkha leaders like Benoy Tamang to campaign in the foothills constituencies such as Jalpaiguri and Alipurduar to ensure that the community votes for the Trinamool.